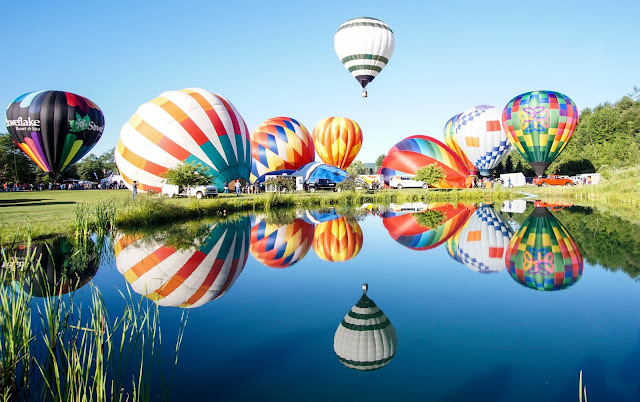 This past weekend we headed up to Stowe, VT for one of the most unique events we’ve ever attended – the 32nd annual Stoweflake Hot Air Balloon Festival. The event is hosted by the Stoweflake Mountain Resort & Spa, on one of the large fiends on the property. Over 25 balloons launch at once in front of a crowd of local and tourists over the Green Mountains. One of the most challenging aspects to hot air balloon flights is the weather. The winds need to be really light and the temperature mild to ensure safety and the perfect flight. Luckily we were blessed with the perfect conditions and were able to watch flights on both Saturday morning and evening. It was amazing how close you could get to the balloons taking off. The myriad of colors and designs made for a majestic site soaring over the town of Stowe. On top of the balloons there was a live band and local food, drink, kids activities and VT merchants adding to the atmosphere.